Yesterday, the September corn contract closed down 2 3/4 to settle at $3.36, and the December contract slid down 2 1/2 cents to $3.51. The corn market continued its downward movement with low trading volume, weakness in wheat and lack of bullish news. 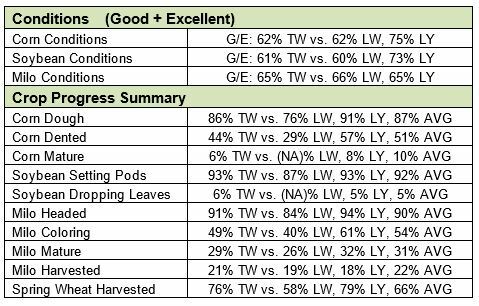 The crop conditions report came out yesterday afternoon with corn remaining steady at 62% in the good to excellent categories. The September beans contract fell 3 3/4 lower yesterday to settle at $9.35 1/4, and November closed 3 1/4 lower at $9.41 1/4. The bean market started higher yesterday, but lost steam from the weakness in grains despite soybean export inspections being the largest since April. Soybeans continue their downward movement with the improved crop rating, and the 88.7 million acres of beans are nearing harvest, which is the largest bean acres number on record.